From the Kraftalm pasture (1,355 m) you have a wonderful view to the Inntal valley. Hiking near the Stanglalm pasture in the Kitzbühel Alps. The hiking path Gerstinger Joch with view to the Grosser Rettenstein peak. We’ve made it! On top of the Grosser Rettenstein mountain (2,366 m asl). The restaurant with its panoramic terrace and the chapel on the Hohe Salve mountain. Panoramic view from the Hohe Salve peak (1,828 m asl) to the mountains and valleys in the surroundings. View from the Steinbergstein mountain to the Windautal valley in the Kitzbühel Alps. The Hahnenkamm mountain - in wintertime a famous skiing area - with view to the Wilder Kaiser mountain chain. The area of the Neualm pasture is one of the most unaffected areas of the Kitzbühel Alps. Snowshoeing to the peak of the Kitzbüheler Horn mountain. The Kitzbühel Alps extend into the Zillertal valley and the Zeller See lake. 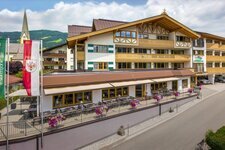 In the south the Kitzbühel Alps are bounded by the Gerlos pass and the Salzachtal valley, which separates the mountain chain from the Venediger mountain group. In the north the mountain chain is bounded by the Kaiser mountain chain, in the north east by the Loferer Steinberge and the Leoganger Steinberge, in the east by the Salzburg Schieferalpe, in the south there is the Grossglockner mountain group, in the south west by the Zillertal Alps, in the west by the Tux Alps and in the north west by the Brandenberger Alps. The Kitzbühel Alps include the areas St. Johann in Tirol, Kitzbühel, Pillerseetal, Brixental, Wildschönau and Alpbach. Peaks: the most important summits of the Kitzbühel Alps are the Westliche Salzachgeier (2,469 m), Kröndlhorn (2,444 m), Grosser Rettenstein (2,366 m), Geissstein (2,363 m), Wildseeloderer (2,118 m), Grosse Beil (2,309 m), Grosse Galtenberg (2,425 m), Hohe Salve (1,828 m), Schmittenhöhe (1,965 m) and Hahnenkamm (1,712 m). Trails: the mountain chain of the Kitzbühel Alps is characterised by rugged peaks and is perfect for hiking and skiing, as there are several large skiing regions in this area. Also a numerous alpine pastures and taverns characterise this area. Enjoy exploring the landscape!